This was my favorite Soul Screamers book so far! I loved the pacing---this book was full of action with no lulls in between the emotional, action-packed scenes. I read My Soul to Keep really quickly because I just couldn't put it down. Every time I'd get to the end of a chapter, I just had to keep reading to find out what would happen next. The plot was more intense than My Soul to Save, with plenty of suspense and surprises. I suspected what was really going on but was still upset for Kaylee when it came to pass. One of the things that sets this series apart is the writing---the writing is really clever for being a YA series. I like Rachel Vincent's phrasing and smart metaphors. 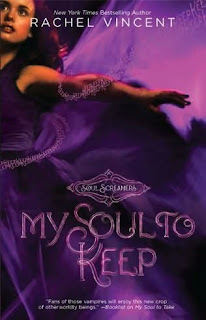 My Soul to Keep recaptured the romance, suspense, and emotion of book one for me, and I started book four: My Soul to Steal, immediately after finishing because I just couldn't wait to find out what happens next!